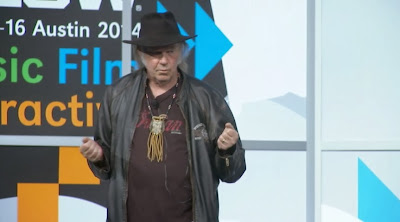 Neil Young launched the PONO audio system yesterday at the SXSW Conference in Austin, TX. In less than a single day, the Pono Kickstarter campaign has already exceeded its goal of $800,000 and is currently tracking at over $1.7 million. The two signed versions of the Pono are sold out. Even all 30 invitations of $5,000 pledges for a VIP dinner invitation & PonoMusic listening party hosted by Neil Young are already gone. Will Archives 2 be getting a physical release (Blu-ray preferably) or just a downloadable release from Pono music store only? I have been doing a few calculations into investing into PONO system. PONO $400, upgrading my truck music system $350(currently own cd/fm player), headphones $175,extra 64GB Memory Cards( at least 5 to start off ) $50 bucks each= $250,then downloads of at least 100 albums(I'll have to be very choosey,good thing it still will play my CD rips) $20= $2000; total $2825. Good sound is worth it. If this gets Neil to release Archives II it will be fantastic. Good point Martin, if Archives 2 is going to be digital only we may as well be told now so we can buy a Pono at the introductory price. I'm still hoping for Vol 2 on CD and BluRay to match the existing ones but that seems unlikely. Can you shed any light Archives Guy ? Shakey Pictures is not doing away with the blu-ray format! Archives Box II will be just as great if not better than Volume I. 192khz 24 bit song files with HD video and multiple features will still be included in Volume II. J Criswell - CD box too do you think ? At this time we are still planning on physical release for NYA V2 and yes it will be available on Pono, too in full 24/192 sound quality. I'm happy to report that we are in full on production of NYA V2 right now. Maybe I'm biased, but I think V2 might be the best one. A plethora of previously unreleased tracks. Thanks archives guy, great news. Always appreciate hearing from AG, but not sure he really confirmed anything so far as Archives/Blu-ray is concerned. Apart from the "at this time" qualifier, "physical release" could mean CD only. And the emphasis on Pono providing the 24/192 experience also suggests that might not be happening with the physical release (i.e., CD but no Blu-ray). But I share his enthusiasm for the Vol. 2 content, and at this point would settle for mp3s (or maybe even eight-track) just to be able to hear the damn thing. Thanks on the NYA V2 news AG. Not that you're not busy enough already, but is NYA V1 in 24/192 format for Pono in the works as well? That was already done for V1 Blu-ray, should be a simple enough matter to offer them as standalone audio files. I wonder if Pono will sound as good as / better than Blu-ray and/or Vinyl. I know this is all academic since probably nobody can tell the difference anyway if they'd take a blind taste test but I wonder what the official line is. Which is best/worst. Johan- There is no speculation necessary as to whether pono sounds better than bluray. The underlying audio format used (24bit 192kHz) is exactly the same for both. Flac (as will be employed by Pono) vs dolby hd vs any other lossless compression format makes zero difference in sound quality - that's what lossless means. Likewise, Pono will be of roughly equivalent quality to SACD and dvd audio. There are some real technical differences with SACD (dsd vs pcm), and dvd audio is usually 96kHz at most, but you would be hard pressed to hear a difference. As to vinyl, the argument that vinyl sounds "warmer" will never die, but the technical capabilities of hi-res digital audio are certainly greater. As it turns out Pono is not a format at all, but an attempt to popularize a player + online store, pono wants to be the ipod+itunes of hires audio. The parallel is very strong actually,since in a very similar fashion Apple did not invent the portable digital audio player, or compressed digital music, or even the online distribution of such. They just made it popular. Perhaps pono will do the same, only time will tell. Might hear some slight difference if the much-hyped digital-analog converter in the Pono player is better than the one in your Blu-ray player (or vice-versa). Archives Guy, thanks very much. You helped me out when I was having problems with the download on Vol 1 and I appreciate that and your input here. I know I speak for everybody when I express my wish that Vol. 2 comes out soon. FWIW, I would be willing to buy it only in Pono digital form, if it could be priced less then the hard Blu-rays. Thanks again. I think the time span of Vol. 2 is among the best of Neil's career and I cannot wait to hear in Pono form! !